Electrical stimulation or neuromuscular electrical stimulation (NMES) is a technique used to elicit a muscle contraction using electrical impulses. Electrodes, controlled by a unit, are placed on the skin over a predetermined area. Electrical current is then sent from the unit to the electrodes and delivered into the muscle causing a contraction. Electric stimulation works by mimicking the natural way by which the body exercises its muscles. 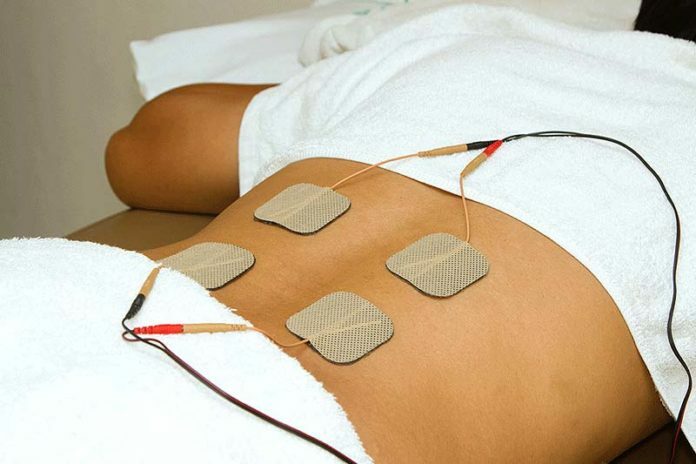 The electrodes attached to the skin deliver impulses that make the muscles contract. It is beneficial in increasing the patient’s range of motion and improves the circulation of the body. It is used in treating conditions like sprains, arthritis, back pain scoliosis and sciatica. Electric stimulation can be muscular, general and transcutaneous electrical nerve stimulation (TENS). The muscular type of electric stimulation seeks to strengthen the muscles by reducing muscle spasms. Also known as EMS, this stimulates the skeletal muscle using electric impulses to cause muscle contraction.